PM speaks with US President, thanks him for Golan decision. 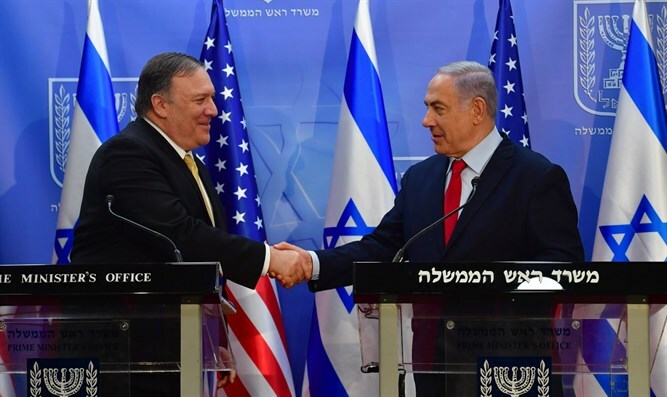 Pompeo: Israelis should know that the battles on the Golan were meaningful. Prime Minister Binyamin Netanyahu spoke with US President Donald Trump shortly after the president called on the US to "fully recognize" Israel's sovereignty over the Golan Heights. In a joint press conference with US Secretary of State Mike Pompeo, Netanyahu called Trump's announcement a "Purim miracle." "President Trump has just made history," Netanyahu said. "I called him. I thanked him on behalf of the people of Israel." "He did it again," Netanyahu observed. "First he recognized Jerusalem as Israel's capital and moved the embassy here. Then he pulled out of the disastrous Iran treaty and reimposed sanctions. But now he did something of equal historic importance: he recognized Israel's sovereignty over the Golan Heights." "He did so at a time when Iran is trying to use Syria as a platform to attack and destroy Israel. The message that President Trump has given the world is that America stands by Israel. "We're celebrating [the holiday of] Purim, when, 2,500 years ago, other Persians, led by Haman, tried to destroy the Jewish people. They failed then. And today, 2,500 years later, again, Persians, led by Khamenei, are trying to destroy the Jewish people and the Jewish State. They are going to fail again," he said. Secretary of State Pompeo said that he studied the battles on the Golan as a cadet in the US military. "There's a famous battle called the Battle of the Valley of Tears (during the 1973 Yom Kippur War). It was Israeli heroism at its most amazing, saving this great nation at a time of enormous challenge, a threat that came from east of the Golan, from Syria. A tank battle of amazing and historic proportions, of amazing Israeli bravery," Pompeo said. "Tonight, President Trump made the decision to recognize that that hard-fought real estate, that important place, is proper to be a sovereign part of the State of Israel.